2 students from Master of Science in Management Program Faculty of Economics and Business Universitas Gadjah Mada, Anggraeni Pranandari and Nuraini Desty, got a chance to join the Graduate Exchange Program in Kyoto University, Japan. This program held on December 2018 until February 2019. 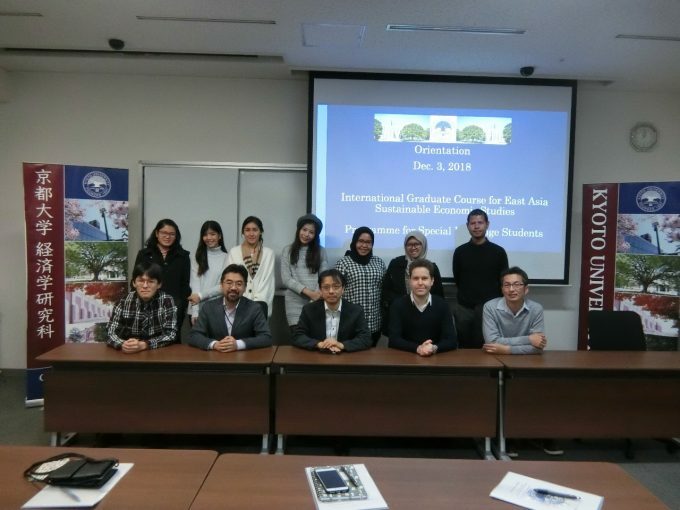 This Graduate Exchange Program was routine program which held by Kyoto University, Japan, and followed by students who came from countries in Southeast Asia. In this winter 2018/2019’s semester, 2 students came from Indonesia and 4 students came from Thailand. When the program takes place, The students are accompanied by Prof. Shuji Hisano who is the Director of the International Graduate Program for East Asia Sustainable Economics Development Studies. He is also a Professor of International Political Economy of the Agriculture Graduate School of Economics, Kyoto University. This program started in December 2018. There are 4 courses, that taken by students, which are: Comparative Industry Policy, Qualitative Research Methods, Cross-Cultural Management, and Field Research in Japan A. During the course, there are activities which stimulate students to be active person. In the Field Research in Japan A course, students are invited to meet with business / creative industries in Kyoto and its surroundings. First field-trip activity held in “Kyoto Makers Garage”, which is an incubator for start-up businesses that are highly developed in Japan. The next activity is to visit the Keihanna Open Innovation Center, which is located on the border between Kyoto, Osaka and Nara Prefecture. In this place, students are invited to look at the facilities to facilitate innovation from the researchers, and the result from the innovations. After completing the exhange program, the students are expected to get new insights. As economics student, knowing the cause and impact of economic growth is a important thing. Don’t let the economic growth cause losses to the environment and it’s surroundings. Beside that, it is also necessary to consider policies which should be made to follow the changing times. In the end, this program is very useful because the students get many insights and new perspectives. In addition, the students cal feel the international exposure which designed in such a way in the student exchange program.